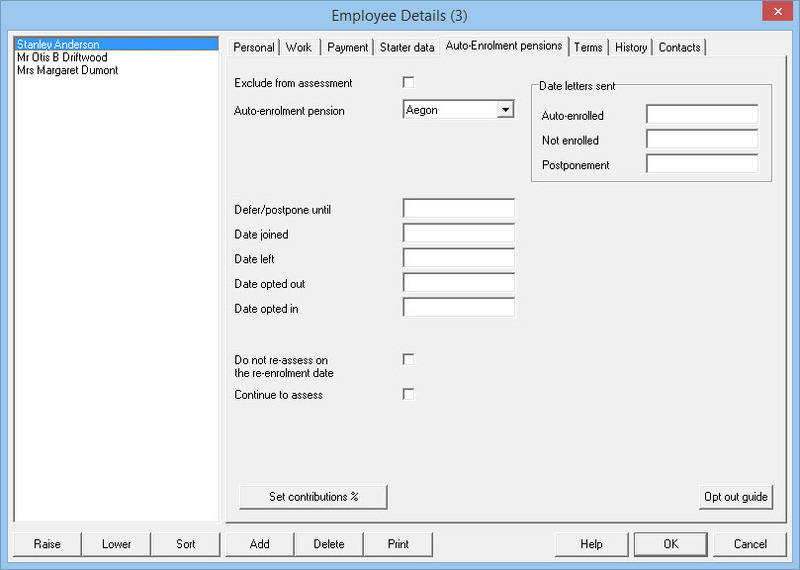 Use this guide to setup Payroll Manager to work with Aegon. The tabs along the top of this screen allow you to add the details of up to 5 different pension schemes. Typically you may only use one of these tabs, but in cases where you have employees that are paid at different pay frequencies (e.g. 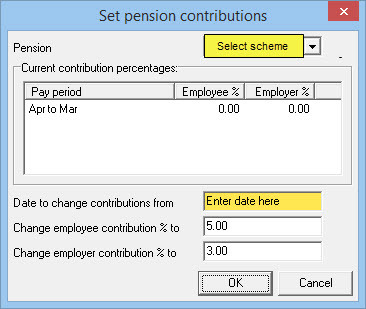 some weekly and some monthly paid employees) then you should create a separate pension scheme within Payroll Manager for each pay frequency and name them accordingly (e.g. ‘Aegon weekly’ and ‘ProviderName Monthly’). Name – Enter ‘Aegon’ (or similar) in this field. Provider type – Select ‘Aegon’ from the drop-down list. VERY IMPORTANT: When you first visit this screen the ‘No tax relief box’ is checked. It is very important that you determine the correct tax relief method for your particular pension scheme and select one of the following three options before proceeding, as this will affect the calculation of pension contributions. If you are unsure which option to select then please contact Aegon for advice. At the bottom-left of this screen is a box marked ‘Include all employees in contribution files (even if they have not joined or opted in’). You should leave this box un-ticked. 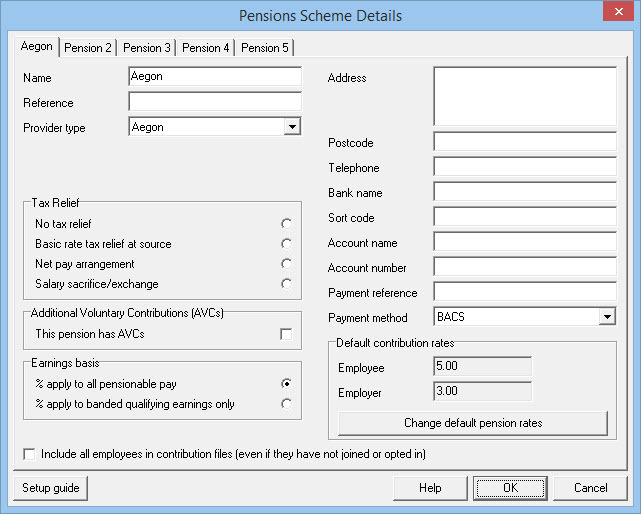 Auto-enrolment pension – Select ‘Aegon’ from the drop down box. Aegon allows you to upload csv files to their website to inform them of enrolments, employee details, pension contributions etc. Payroll Manager can produce these files for you. Make sure that you have the correct pay period selected on the ‘Pay Details’ screen, then from the main menu click ‘Pensions’ then ‘Generate upload files’ then click ‘Aegon’. Click the button marked ‘Click here to create the file’ to save the file somewhere (e.g. the desktop) on your computer. You can then upload this csv file to the Aegon website, according to their instructions. IMPORTANT: You should not use Excel (or any other spreadsheet software) to view your csv files after creating them as doing so may ‘reformat’ some of the fields causing Aegon to reject your file. If you experience problems when trying to upload your csv information then please contact Aegon in the first instance.